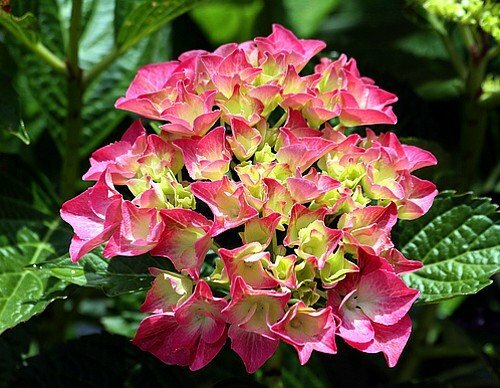 The flowers of hydrangea Glowing Embers start out with a white eye and then fully color to solid dark pink blooms. Blossoms are large, 10-12" across and dry well for winter enjoyment. The foliage of this cultivar is deep green and glossy, with a pretty red tinge. Plant with blue or white cultivars like Nikko Blue or Annabelle, in a mixed shrub border or as a specimen plant along a foundation or near a patio for a sensational display. Hardy Zones 5-9. Sun to Part Sun. Mature Height: 3-5'. Immediate shipping. Size shipped: 4" pot.